The C-20 offers more feeder for your money than the competition. Now you can easily handle the wide stuff with a compact, cost-effective feeder that is as versatile as it is easy to use. 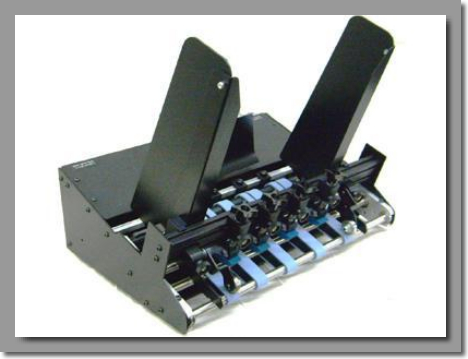 Until now, wide format friction feeders were too costly, too cumbersome, and too complicated. Straight Shooter changes all that with the C-20 wide format feeder. Combining simple, clean design with proven features, the C-20 makes it easy to run those large documents, while still handling the small stuff. With the optional card kit, the C-20 can handle small media down to 2″ wide without compromising the ability to feed large pieces. The C-20 combines heavy duty design with lightweight versatility in the compact package that is easy to move from one application in your plant to another. Now you don’t have to buy multiple feeders to handle various jobs! The C-20 comes with four independently adjustable separators and more feed belts than the competition for unlimited setup options, at a price they can’t touch.